Lowest Priced Semi Ocean Front in Whalehead! Fantastic Ocean Views in this beautiful Semi Ocean Front Spacious 4 bedroom home with lots of improvements and located in the Whalehead Club Subdivision. Just Reduced $45,000. Strong Advertised Gross Rental Income with 11.3 % GRI. Reverse Floor Plan with amazing ocean views through out the top level, open living area with hardwood floors on top level and even the Oversized Master Suite has great Ocean Views, plus Jacuzzi and shower. Kitchen and 2 Bathrooms have beautiful GRANITE COUNTER TOPS and Cabinets. Mid Level has a huge second Master Bedroom, plus 2 additional good size bedrooms ( one with 2 Duo Bunks and one with a Queen), Sitting Area and breezy Screened in Porch. Wainscoting adorns the foyer and stairs. Plenty of entertainment for both kids and adults - Game room on the ground level with Pool Table & Foosball, outside Shuffleboard, Ping Pong Table and Volley Ball. Great Private Pool Area with HEATED POOL for all to enjoy. Lots of out door living also includes the Decks, both Shaded and Sunny. This home has low pressure SEPTIC SYSTEM for 6 BEDROOMS with the potential to increase rental income by adding 2 bedrooms. The beautiful pristine soft sand Whalehead Beach is just a few steps outside your front door. Some Recent Updates and Improvements include the following: 2017 installed Granite in Kitchen and 2 Bathroom Countertops with new sinks and faucets, 2017 Refinished Kitchen, Living room and Bathroom Cabinetry, enclosed 2 Master Bathrooms, and Front Stair Railing, 2017 Added Shuffleboard Court and re sanded Volleyball Court, 2017 Replaced Pool Pump and other parts, 2017 Painted Exterior of house, 2016 Pool Heater and Tiki Bar, 2015 Resided west side of house with LP Smart Siding and Replaced 4 Windows, 2016 and 2013 Replaced 2 front living room Picture Windows, 2013 Screened in midlevel Porch and added second Shed, 2013 Replaced mid level Slider, Solar Shades in living room and dining room, 2012 Built Book Cases. The Plans to add 2 more bedrooms and 6 bedroom rental projection are on file. If you are looking for a well maintained Semi Ocean Front home with Fantastic Ocean Views and potential to add 2 more bedrooms to increase the rental income, and Voluntary $50 annual HOA Dues, then this is the home for you. 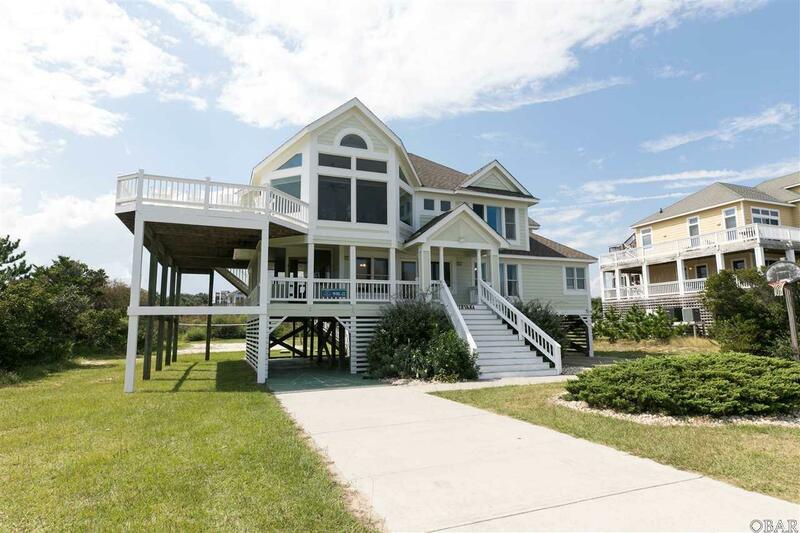 Listing courtesy of Sandra Larue of Corolla Beach Realty.